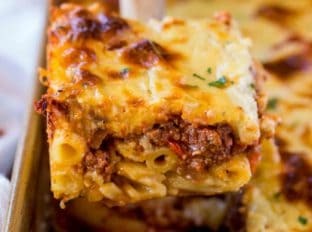 Greek Pastitsio Bake with penne pasta, seasoned ground beef and a rich béchamel sauce baked in the oven until crispy. 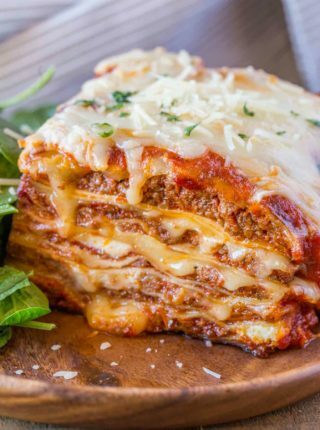 We love baked pastas here including Baked Mac and Cheese, Baked Million Dollar Spaghetti and Ultimate Meat Lasagna because they have crispy toppings and can feed a huge crowd! We love Pastitsio in part because it’s so delicious and shamelessly in part because the name is so much fun to say. Ten years ago I was researching pasta bake recipes for a friend who was about to give birth when I came across a list of pasta bakes from around the world. We tested over 20 of them and Pastitsio became a household favorite. 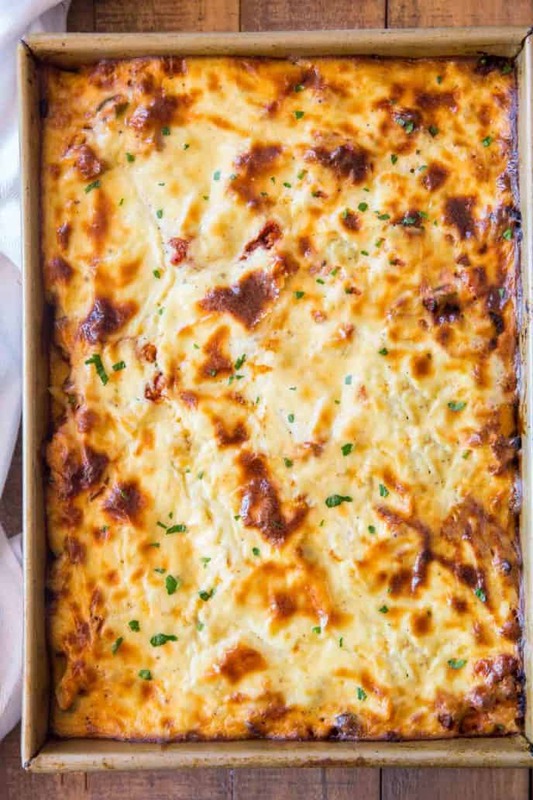 It does take a bit more effort than your classic lasagna recipe, but this is like an authentic greek lasagna recipe and it has the added benefit of being a new flavor! Some people refer to Pastitsio as Pistachio Greek Lasagna so if you’ve ever eaten that in a Greek restaurant this is the recipe for you! There is a second sort of “Greek Lasagna” recipe and I have that one coming to you soon too. That one is called Moussaka. Moussaka is made without pasta. It includes eggplant in the meat mixture and is frequently topped with deliciously browned slices of potato. I actually grew up eating this dish, so I can’t wait to share it with you all. 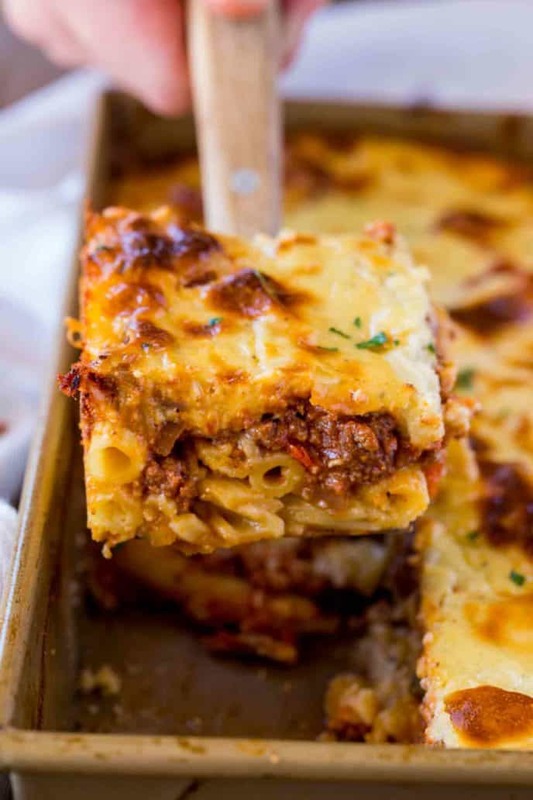 What is the difference between Pastitsio and Moussaka? Moussaka contains eggplant and potatoes but it doesn’t have a pasta base. Both recipes include a creamy baked béchamel sauce as the topping and a tomato and meat filling. Can you use all beef or all lamb? Yes, you absolutely can alter the meat for your tastes. Please remember for an authentic flavor the dish is made using lamb. I use a mixture of beef and lamb as lamb can be rather expensive and is also a very strong flavor. The mixture of the two meats is a delicious combination. Absolutely! This dish is perfect for freezing. Make sure all the layers are independently cooled. Refrigerator level cold is best. Then layer the meat sauce over the pasta until it has FULL coverage. We don’t want the milk sauce to leak into the pasta layer. Finally pour over the white sauce and freeze, covered. To cook, thaw it in the refrigerator the night before. Cook for an additional ten minutes longer than described in the recipe card. Just like lasagna the cleanest slices are if you can allow the mixture to cool for 10-15 minutes after cooking and before serving. Make sure to clean your knife in between slices. Sacrifice the first slice, I usually keep this slice for myself. By getting the first slice out it makes removing the later slices much easier. I generally over it with a soaking wet (but not dripping wet) paper towel and microwave. This creates steam in the microwave which prevents the Pastitsio from drying out. Add the beef and lamb to the pan on medium high heat and cook until browned, another 5-7 minutes, breaking it apart as it is cooking. Drain the oil and add the olive oil to the pan on medium heat with the onions and bell peppers and cook for 5-7 minutes. Add in the garlic, tomato sauce, tomato paste, salt, pepper, cinnamon and bay leaf and cook on medium-low for 20 minutes, until thickened (halfway between pasta sauce and tomato paste). While the tomato sauce is simmering, in a separate dutch oven add the butter and flour on medium heat and whisk well until melted and combined, 1-2 minutes. Add in the milk slowly while whisking until fully combined then cook on low heat for 10-12 minutes or until thickened. Let cool for 10 minutes, then add in the salt, pepper, eggs, and parmesan cheese. 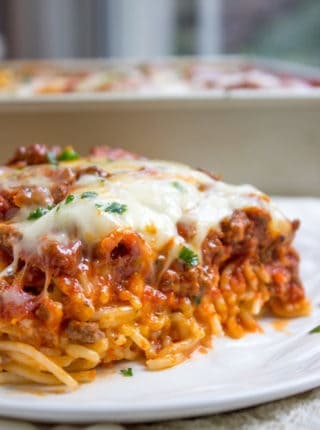 Layer the pasta first, then the meat sauce, then the béchamel sauce and bake at 350 degrees uncovered for 50-60 minutes. Hi Sabrina, this recipe sounds absolutely amazing. I love all the flavours you have included, and can’t wait to get cooking. Quick question, do you feel that 15 minutes is an adequate amount of time for prep? It took me 15 minutes just to read the ingredient list haha! Just kidding :). Will let you know how I go! Haha, I promise not to set a timer for you. Work at your own pace. Enjoy! Ive made this twice with pork and beef instead of lamb and it is beautiful and delicious! Hi I’m in the process of cooking this and wondered if I cook the pasta before putting it in the oven? Yes, cook it but don’t rinse it. Enjoy! This was amazing ! Never even heard of this but love trying new things. The only thing I’d suggest is to double the spaghetti sauce ingredients becuase it was dry without it. Had to add some spaghetti sauce out of a jar on top which was still great! Definitely a keeper thank you ! Even My picky 7 and 3 year old liked it. I know how hard it is to please picky eaters so I’m so glad everyone loved it! Thanks for the 5 stars, Taryn! 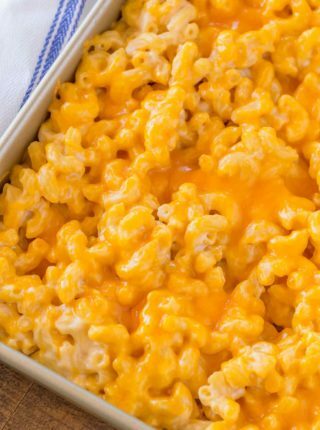 I am dying to try this, but what size pan should be used to put this in? 9 x 13? Vs other size? You’ll want to use a 9×13 dish for this recipe. Enjoy! This is a delicious one dish meal. I did use 3/4 lamb and 1/4 beef as we enjoy the flavor. I also used 1 t of cinnamon to make it more unlasagna/like. Truly a great dish. 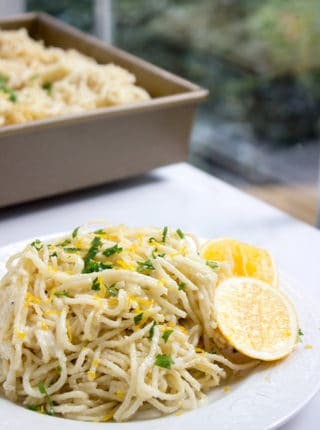 I want to make this with fully cooked pasta. Your recipe calls for 1 lb. dried. How much cooked should I use? 0.17 tablespoons? Not sure about those. But will figure it out my way….. Absolutely loved this … the whole combo with the bechamel sauce … yum…. definitely make this again …. made extra to freeze for lunch or dinner ? Do you think I’d be able to make this in a crockpot, and if so what heat setting should I use and for how long? I’m trying to learn how to cook delicious meals and this dish looks tasty! I’m not sure the custard would set enough in a slow cooker, sorry. Can you tell me what the baking temperature is? Maybe I am just not seeing it. I was going to make it tonight. It looks yummy! Sorry about that….you’ll want to bake it at 350 degrees. I’ve updated the recipe card. This recipe looks so interesting! My family would love it! What temp do you bake this at? I may have overlooked it. I assume 350? This looks amazing & I can’t wait to try it!! Perfect meal, just omitted the red bell pepper & bay leaf in order for it to be a true Greek Pastitsio!!!! I can’t believe I have NEVER heard of this before!!! looks amazing! I always wanted to try making Pastitsio, and after reading your recipe I’m going to ‘go for it’! Even though there are a lot of ingredients involved, I always have all of them on hand, except that I’ll need to buy lamb. For the sake of an elderly relative with health issues who lives with us, I’ll try to ‘lighten-up’ the recipe by using very lean ground sirloin (96/4%) with the ground lamb, reduced sodium tomato products, and whole grain pasta. I feel that if anyone needs more salt, they can use the salt shaker on the table, right?This sounds super yummy, and I look forward to making it. I hope you enjoy it Angelina! Glad you decided to give it a try! This looks so delicious! Need to try soon! 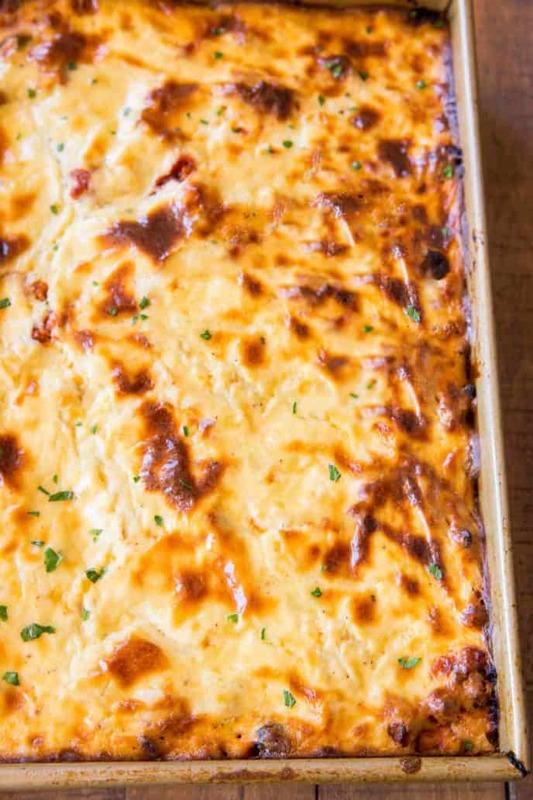 At what temperature should the Greek Pastitsio be baked? Holy smokes… I knew I had to try this, the moment I saw it! ?? I love pastitsio! I have had it on holiday and I have only made it once so I really need to try it again. what size dish is this meant to be baked in? Can’t wait to try this! Do you think it would work with bucatini or some other really thick strand pasta? I’m not a big fan of penne. Thank you!!! You can use ziti. The bigger the pasta, the better for the sauce to get in. I do not use any tomato sauce. I use 32 ounces of whole milk ricotta and mix it into the pasta along with butter, eggs, and grated cheese. Parmasian or Romano . This was the way my mother made it. I wish this was the kind of dish I grew up eating too. It looks amazing!